I think we’ve established that we don’t have a fenced yard, and we’re still working on helping Baxter remember he has to come when called. So any time Baxter goes outside, he’s wearing a leash, and a human is holding the end. As the human responsible for the first and last outings of the day, I love a full moon. Being able to see my shadow at 6am and 10pm is a luxury. On most of our walks this winter, I was stumbling over ruts, tripping over tufts of grass, straining my eyes for telltale strips of white–and my nose for the putrid scent–that signifies skunk. Now that the days are getting longer, our walks are starting to be lit by the rising sun. However, I still have a special fondness for moon walks. 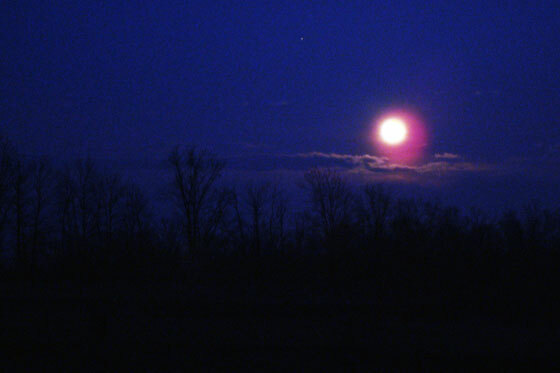 While the full moon is reputed to cause craziness, full moon walks are so much more relaxing. What drives me crazy is if my full moon is hidden behind cloud cover. Aside: Apparently there was an eclipse yesterday. I missed it. Eclipses are neat enough that I would have given up my full moon without complaint. What’s your favourite phase of the moon? Is anyone else wandering around outside in the wee hours of the morning and night? Did you catch the eclipse? I tried to stay up to watch the eclipse but just couldn’t. I’m getting too old for late nights! I could totally relate to your blog. I too love a full moon which brightens the tree branches and casts shadows. The best for our just before bed outing. No eclipse out this way. I checked several times throughout the night. Are you getting out for your outings yet? Or just watching the moon from the window for now? We went outside to try to catch the eclipse the other night. We saw it, but we didn’t wait around long enough to see the red glow the moon apparently had later on. Good for you for catching at least part of it. I stayed up to watch, but when we went out the eclipse was behind the clouds. Boo! How’s Luther now that you’re back? I’m sure you missed him during your trip. He was super excited to see us, and us likewise. We did miss him tons!!! Though we enjoyed being able to sleep without him jumping up in the bed constantly!